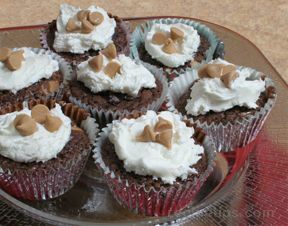 If there's a fight for the beaters after baking, these cupcakes are perfect for you. There's a surprise in the center of these that everyone will enjoy. 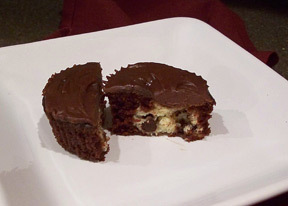 Use your favorite cake mix to change up the flavors. Cream the butter, white sugar, and brown sugar with an electric mixer in a large bowl until smooth. Add egg and vanilla; beat until smooth. Add the flour mixture until combined. Stir in the chocolate chips. Form the dough into tablespoon-sized balls and place on a baking sheet. Freeze until solid, approximately 2 hours. Preheat an oven to 350 degrees F. Line muffin tin with paper liners. In a large bowl, combine cake mix, water, oil and eggs. Beat for 2 minutes on medium speed. 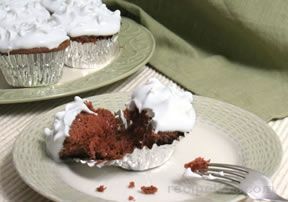 Spoon into prepared cupcake liners, filling each 2/3 full. 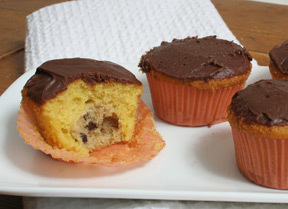 Place a frozen cookie dough ball on the top center of each cupcake. Bake in the preheated oven about 16-18 minutes. Do not overbake; you want the dough ball to still be a little doughy. Cool in the pans for 10 minutes before removing to cool completely on a wire rack.